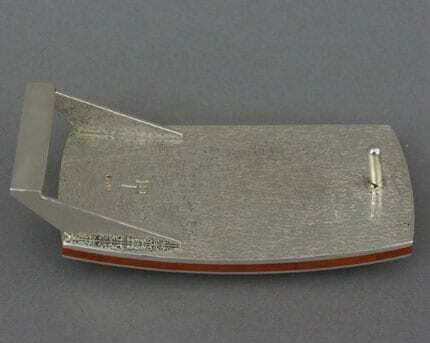 The surface of Chris Pruitt’s sterling silver belt buckle is beautifully textured. 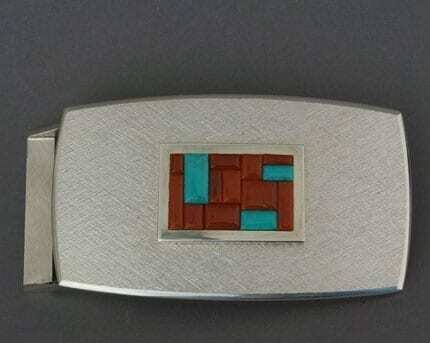 Cobble inlay of natural Lone Mountain turquoise and coral completes the top surface. 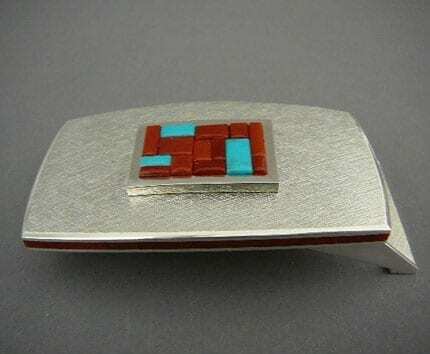 This stunning buckle includes Pruitt’s signature side inlay. The coral sandwiched between layers of silver is an exquisite feature. Elizabeth James-Perry Choker An exquisite traditional Wampanoag woven choker in stunning deep purple and white colors by artist Elizabeth James Perry. Perry combines the patterns on the individually cut beads to maximum aesthetic effect. This is an orca (killer whale) representation reminiscent of Northwest Coast designs. The dangling pendant, a beautiful piece in itself, represents the orca's dorsal fin. Wampum has been used by coastal tribes for thousands of years. Items made from quahog shells, commonly called wampum, are culturally significant to New England tribes and are held in great esteem within families and within tribes. Perry hand selects each quahog shell for color and other qualities. The shells are cut and drilled into tubular beads. Perry continues this traditional work form as a way of honoring her connection to her ancestors, their history, their way of life, and the ocean that sustains them. The wampum section of the necklace is approximately 10" long x 1/2" wide. 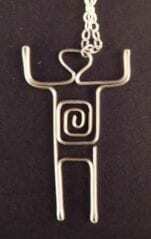 The pendant is 5/8" wide by 1 1/2" tall. The deerskin can be tied to different lengths, to fit as the wearer wishes. 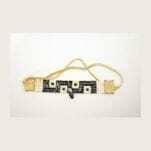 The 5 strands of beads are painstakingly woven, as can be seen in the detail image. The deerskin is smoked and tanned in the traditional way of New England Native Americans. Materials: quahog shells, hand-tanned deerskin, linen. Woven section is 9 1/4" x 1 3/8"; total length including choker and strip is 30". Deerskin strip is knotted behind the neck when worn. These earrings are made from cuttlefish cast sterling silver. They are extremely elegant, with a small, natural Sleeping Beauty turquoise cabochon and ear wires. Note how the earrings look at different angles of light reflection.